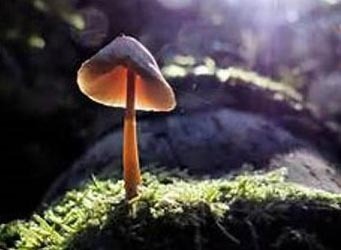 Today, I came across numerous species of mushroom and fungus. Beautiful visual language, which always has a roof! The stems like pillars; round, slim, restrained, robust, radiating strength, like the round nose of Cyrano as played by Gerard Depardieu, arched fragilely like a classical dancer, entangled together in such a way that an architect like Gaudi could have used them in a project. And what a wide range of caps; curled downwards, upwards, a similar style a gnome’s hat, rounded like the handle of a kitchen cabinet door, bowls in various colours with irregularly curved edges, lying on top of each other like a 17th-century lace collar. 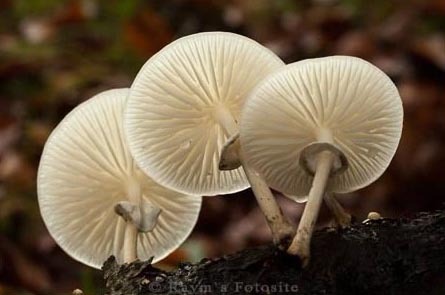 Many characteristics, shapes and details of mushrooms and fungi are used in the sciences, medicine, art and architecture. 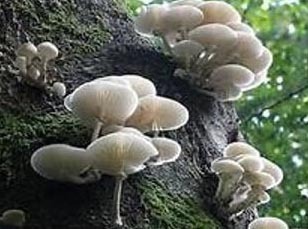 The lamella of fungi have contributed, among other things, to the development of insulating materials, the almond mushroom is used as a remedy for cancer, and many other types are used as fantastic sources of vitamins. Clothing and, in particular, hat designers learn a lot from this natural phenomenon and there are also those species that are known for getting you high. 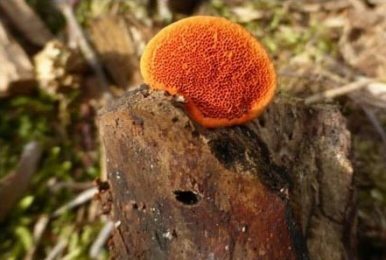 The dry rot fungus is well-known among architects and its victims, not so nice if you have these in your house. 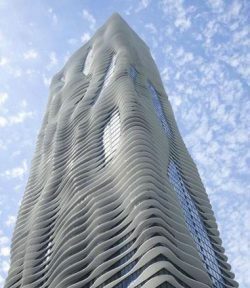 However, the exciting multiple shapes of mushrooms and fungi can also be found in architecture that is often appealing. Art Nouveau is an architectural style (around the 19th and 20th century) in which shapes related to nature played a large role. 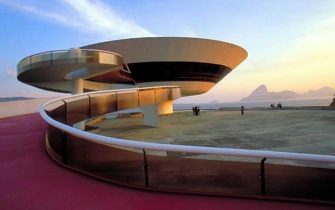 However, there are also directly traceable examples, such as the penthouse of the Bzyantium in Amsterdam, hanging like a fungus on the building (designed by Rem Koolhaas) or the Museum of Modern Art in Rio de Janeiro designed by Oscar Niemeyer. 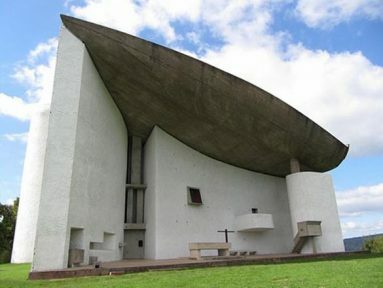 The chapel of Notre Dame du Haut* in Ronchamp by le Corbusier has organic shapes, which cannot be directly interpreted as a related shape, but which are tangible as a mystical force; something that I can also experience if a mushroom or fungus surprises me. Box hedging, yew hedging, lawns and lavender meadows can provide fantastic images, and are thus widely used in gardens and landscapes, but mushrooms and fungi are more often found by accident and not everyone is pleasantly surprised and fascinated or amused by the complexity or comicalness of the shape. It is associated with rotting, decaying, decomposing; a damp musty smell which make your limbs grown stiff. 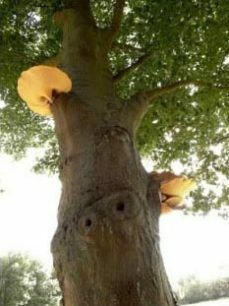 And you may have been told a very scary fairytale when you were younger, in which the witch makes a deadly soup made with fungi and mushrooms. Nevertheless, this group of organisms offer much that makes them exciting to use. 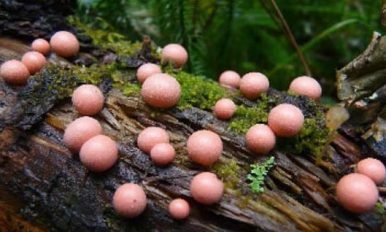 You do not plant them, but instead create the circumstances, so that the variously shaped fruiting bodies suddenly appear by surprise, full of anticipation. 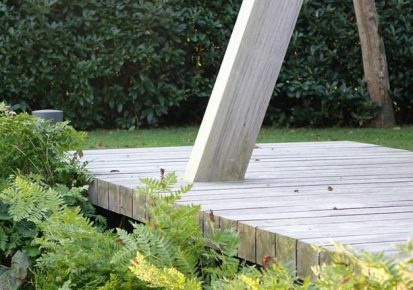 On a November day in 2001, I visited the Bundesgartenschau (Federal Horticultural Show) in Potsdam near Berlin, and in a remote corner of this garden and landscape show (similar to the Dutch Floriade) where almost no members of the public came, I came across a constructed natural landscape, within which there was a section of about 300 m2, consisting of mainly mushrooms, fungi, ferns, moss and water. There were different hard and soft types of wood stacked on top of each other under trees, occasionally with some structure as you would find in your own firewood storage shed and sometimes like branches falling on top of each other. Next to and between the thick green carpets of ferns and moss, there were numerous different mushrooms and fungi, sometimes entangled and sometimes solitary. 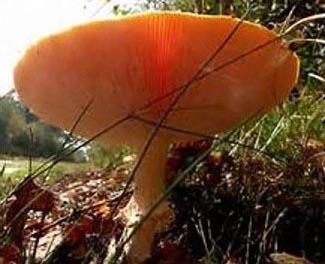 White, grey, red with white dots, chestnut brown, orange and yellow; a multi-coloured variety. 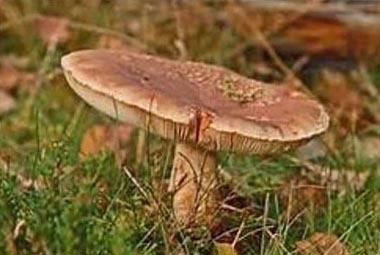 This was stimulated through dryer and damper spots, by young and aged dying wood, with hard species like Acacia, Oak and Sweet Chestnut, and soft species like Willow, Beech and Lime. 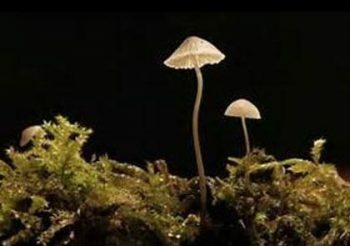 Damp smells, streaks of light through the foliage, green and brown tints, and the stars and supporting actors who had conquered a spot via their mycelium. 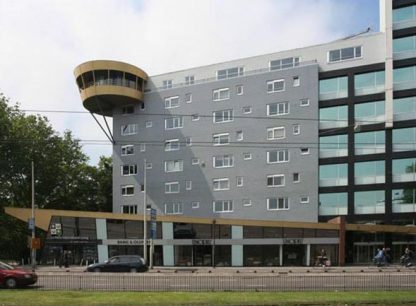 * An obvious example how architecture can connect. Notre Dame du Haut is breath-taking. Le Corbusier has translated the environment into the building; the curved hill is continued horizontally and vertically in the floor, walls, roof and open air. Several stained-glass windows in the wall openings light up the baptismal font even more at certain times of the day as a result of the sun. You cannot escape feeling your birth, life and death at this place. Grasses as solitary plants and as large fields combined with bulbs, perennials and shrubs have stolen the hearts of many among us. 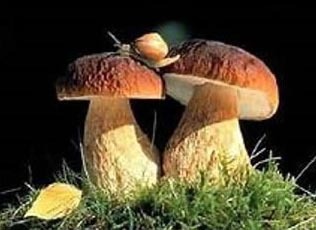 They can be easily used in combination, most of them do not fall over and they can be grown in almost all types of soil. 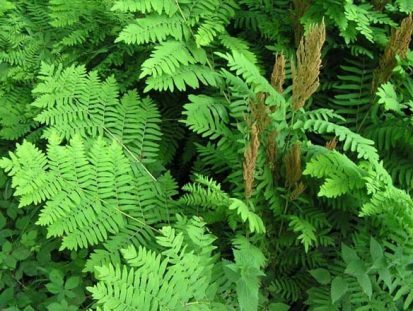 Even though ferns also have these characteristics (except requiring more care with the soil), they have not been as popular in the garden and landscape world. Undeserved in my opinion, as I think they are underrated beauties. The different leaf structures can be combined beautifully with other foliage plants that also share its blossom and characteristic shape, such as Astilboides tubalaris, the purple-leafed Black cohosh, different species of Rodgersia, Solomon’s seal, different species of Hosta and Anemones, etc. Grasses also go together beautifully in groups and as solitary plants with ferns. Plenty of choice, therefore! 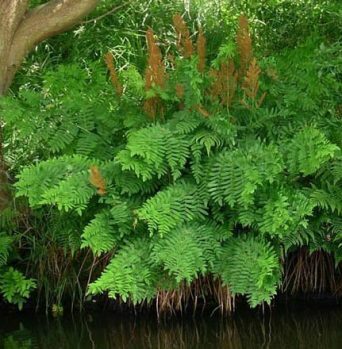 One of my favourites is the Royal Fern, the Osmunda regalis. As its name would suggest, it radiates power and demands respect. It has a different appearance each season and fascinates in terms of its detail and charismatic grandeur. 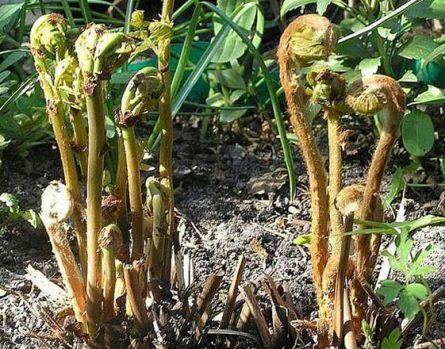 In the spring, it slowly unfolds, first having grey woolly fronds that turn brown in colour and subsequently slowly rise up, finally folding out like hands. 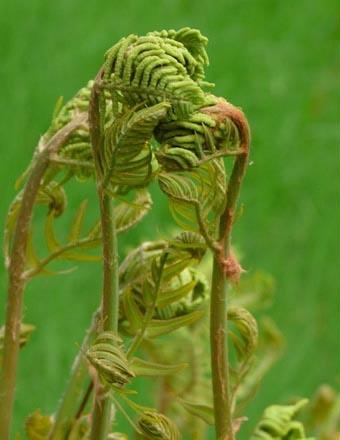 As the leaves spread out, the blossoming begins below, orange-brown upright fronds. 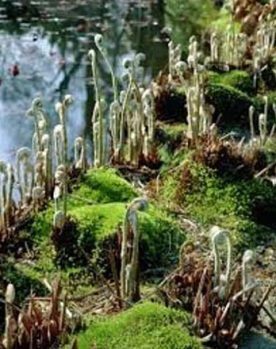 In contrast to most other ferns, it can stand in water, in soggy soil, by waterfronts where the soil is low. 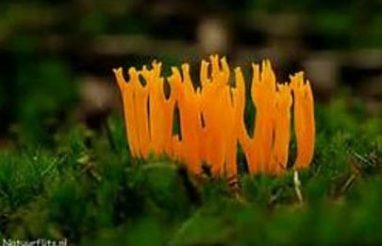 They also have no difficult in dryer conditions and they also thrive in spots where there is no sun from 12:00 to 16:00. 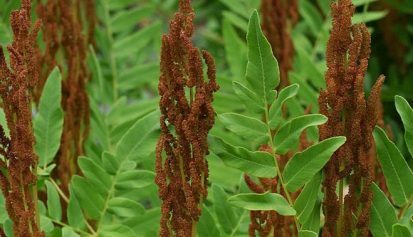 A fern with a powerful personality, which can be married with the sturdy trunk of a heavy tree, an overhanging branch or a strongly designed form.